NBALIVE.GG was shut down on July 9th, 2018. You're viewing an archive of this page from 2018-06-29 at 07:59. Thank you all for your support! Please get in touch via the Curse help desk if you need any support using this archive. 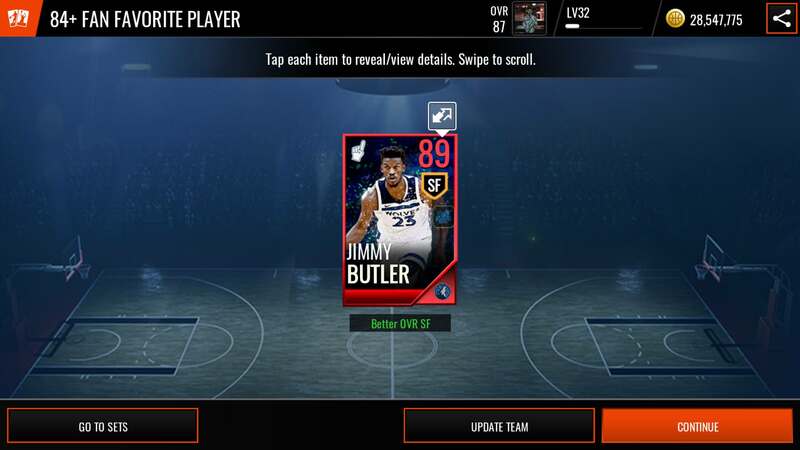 Odds of pulling 89 Butler from the 84+ FF set? I would be very surprised if the odds of pulling an 87+ were the same as an 84-86 when completing the 84+ set. My guess is that it's weighted toward the lower OVR players. No actual data to back this up though, just hypothesising based on most other sets. I pulled that 89 ff butler but that is from the 87+ set. My experience with the 84+ set tends to give the lower ovr. Pulled lin, smith 3x, prince 2x, and the one lucky card that turned out to be 88 ff embiid. I would still say that embiid was only luck and not the norm. Just to clarify, my post was meant as a joke because I have two that don't fit anywhere in my lineup. Obviously, if I had pulled the JR FF card then I would've made room for him as well in my lineup since I'm a Cavs fan. Hence the whole one man's trash is another man's treasure reference.